The Z-Plug offers a variety of attachments to make your business more versatile. Six attachments means 6 more ways to generate revenue. 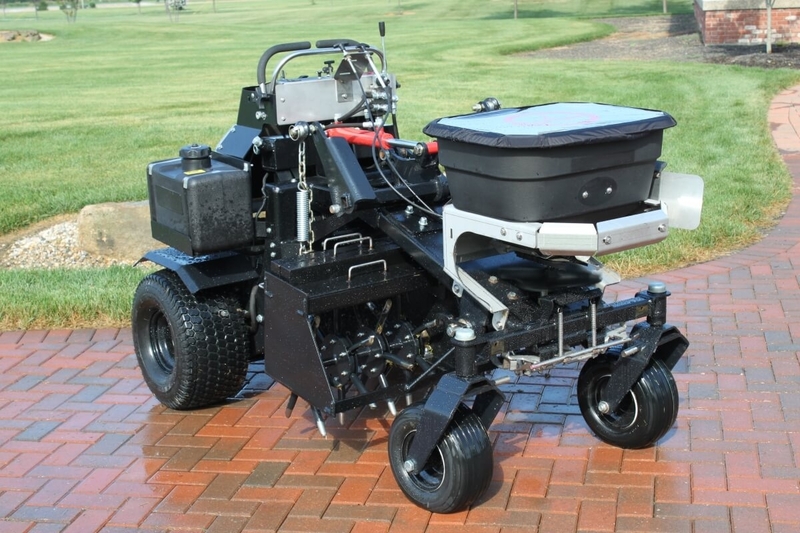 Add granular spreading capability to your aerator with the 120 lb. hydraulic spreader. 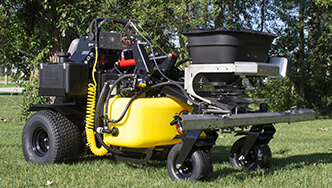 Over seed or fertilize while aerating to increase profits. Add spraying capabilities with the 30 gallon spray system for the Z-Plug. Includes an 8' boom, 5.0 GPM liquid pump, Hypro Al tips, 25' coil hose, pressure gauge and a speedometer, the Z-Plug becomes capable of applying liquid product. With 3 rows of off-set spring loaded tines, the 46" De-Thatch Rake is a valuable tool. Removing the unwanted thatch layer can be a key component to healthy turf. The 52" Snow Plow attachment adds another revenue generator to your Z-Plug. With 5 designated positions, the snow plow can be angled to a width of 48" making it ideal for sidewalks, driveways and small parking lots. With 18 rows of spikes (2" on center), the Spiker attachment is great for light aeration and seed bed preparation. Using the spikes to penetrate the surface creates an excellent environment for seed germination. 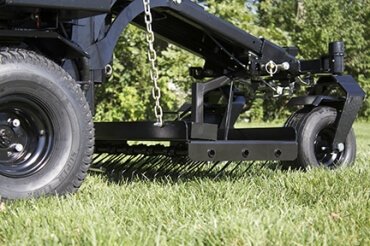 Over seeding, turf repair, or complete renovation, the 36" slit seeder is a valuable attachment. 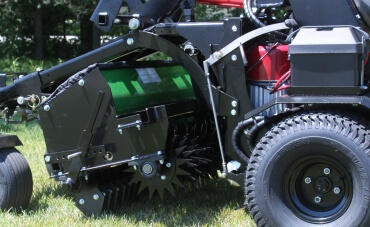 In a minimal amount of time you can convert your Z-Plug unit from an aerator to a slit seeder. Adjustable front knives can be adjusted depending on the soil or turf conditions.